Today I’m going to begin a Tips and Techniques series here on my blog, starting with some comments on some basic equipment everybody who wants to cook will need. Stocking a kitchen for the first time can be a very daunting – and expensive – experience. But let’s face it; you can’t cook with out pots pans and utensils! I strongly recommend that you ask family and friends to help you get started stocking up on the basics. Let them know you are interested in learning to cook. Every experienced cook has too much equipment in their kitchen, and you’d be surprised what people will be willing to pass on to you. And there is no shame in getting started with recycled equipment. The most important place to start is to be sure that, as an absolute minimum, you obtain three good knives. Just three! Don’t be fooled by those huge sets of knives that come with a “free” butcher block holders. You do not need all those knives! On the other hand, I would be lost if it wasn’t for my three good knives! 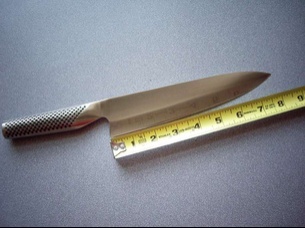 You will need one all-purpose chef’s knife with a 7-to-9 inch blade. (The blade is measured from the tip of the blade to the beginning of the handle.) You need to actually hold this knife in your hand in order to pick one that feels comfortable, and well balanced in your hand. A good chef’s knife can get very expensive, but worthwhile. Starting prices for good ones are usually about $50. You will also need a serrated edge knife. That’s the kind with the saw tooth edge. It’s perfect for bread, cakes, and cutting tomatoes. It is not essential that this knife be top of the line, as you won’t use it as much. There is no reason that all of the knives have to be of the same brand. 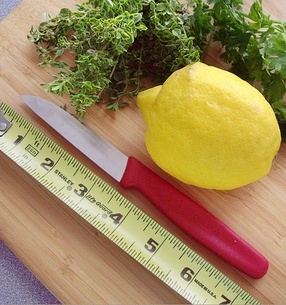 One small “paring” knife with a 2-to-4 inch blade is essential for all small tasks in the kitchen. Victorinox makes a perfect one that sell for less than $5. It is incredibly sharp and for that price you can’t go wrong. 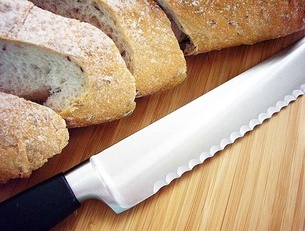 Most knife shops or small kitchen shops sell these knives. Many small knife shops sell “reconditioned” knives. These 2nd hand knives are usually available at a real bargain. This is a good way to get a knife you might otherwise not be able to afford. Buy the best knife you can afford. It will last forever and you won’t be sorry! Do any of the more experienced cooks out there disagree with this? Are there other kinds of knives a beginner would find useful? Update I have submitted this post about my favourite cooking knives to the “I’ll show you mine if you show me yours” food blog carnival, and I’d like to offer a special welcome to readers who are joining us from the “I would be lost if it wasn’t for my ______” September edition. If you enjoy your visit here, I invite you to subscribe to The startcooking.com RSS feed or sign up to receive an email whenever there’s something new. I’m ashamed to admit I own 2 separate butcherblock knife sets that I never use! This is really helpful info for me… I’ve always been so confused about what all those knives were for. Absolutely agree. My pride and joy which I cannot do without is my 10” Wusthof Dreizak knife. It’s great from everything from slicing through big root vegetables to crushing (or finely slicing) a clove of garlic. When you look at the knives that come in those blocks – yuch, they never hold an edge and most of them are pretty useless- I mean how often are you going to fillet a piece of fish – that’s what fishmongers ate for …! The other thing to think about is how you keep them sharpened â€“ while I use a steel, I know that a lot of people donâ€™t use them â€“ whatâ€™s your views on those double-sided pull through sharpeners? Another fun discussion to have at some time is about those totally useless gadgets we all fill our kitchens with which are never used. My favourite (harking back to a previous thread) was a mixer got making white sauces, it was meant to mix and heat on its own â€“ totally useless!! Jennifer, The Skinny Chef has a great new video on Sharpening Knives. Itâ€™s a really helpful tutorial that even explains how to judge a 20 degree angle! Itâ€™s definitely worth checking out! Cheers! I really enjoy your blog. The recipes are great, and there’s a huge range too, which I love. My girlfriend has slowly begun teaching me cooking, and I seem to have developed an obsession with cooking knives. Your blog always gives me something new to try, which is awesome. Thanks Bede! My goal is to always have startcooking.com be a place to come to and learn the basics. Good luck! I completely agree with you. I have more knives than I know what to do with here, and I really only use three on a regular basis. I’d much rather have one high-quality chef’s knife instead of 21 cheap knives that won’t stay sharp. Great blog! I just found this site and it’s full of wonderful information. I’ll be checking back on a regular basis. Thanks Sabine! I love your knife safty tips! I have to admit..I have been watching a lot of your videos over the last several months and its the first time I show interest in anything to do with cooking be it a celecrity chef tv show or a popular recipe book from the nearest book store. I tried to cook once or twice last year..simple pastas really with my mothers guidance and it was not much of a failure. I am not sure if its laziness that stops me or the way I was raised..my mother has pampered everybody in this house and unfortunately I was always kicked out of the kitchen as a child… She has been to kind..yet dangerously.. I have saved all the email recipes I receive from your website since I have subscribed and its all kept safely in my folders…as well as whatever I find interesting on your website..and hopefully in a year’s time I should be up and running.. I am thinking of trying out one of your simplest of recipes soon and share with you the results. As everyone else has stated above WELL DONE! I think this website has really changed some of our lives and our perception of cooking..these videos are made so beautifully that one would feel silly to make an excuse..its all been simplified to the maximum. Thanks Sheida! Comments like yours makes me feel so good! I’m looking for my first “official” chef’s knife…not just the ones we are all stuck with in the block. This post has been very informative for me. Thanks for the help in my search! As I am sure you have discovered, good knives can be really expensive. Any advance research is great but it is really important to make sure the knife feels good in your hand. Victorinox’s Forschner chef’s knife is in the $30 range and is an exceptional knife for the price. Perfect for folks just learning how to cook as its extremely easy to care for.